I was walking along the Riverwalk in early April (shortly after the theme was selected) and noticed that the shadow in the Chicago River, created by the Columbus Street Bridge, was pretty interesting. It resembled a pool that is used for swimming races - the kind with the lane dividers. The shadows from cars, taxis, and trucks that drove over could be the racing swimmers. Here's a side view of the shadow and the bridge that created the shadow. Plus there's some bonus shadows: the railings from the Riverwalk create some geometric shadows along the sidewalk. In the plaza area of the Aon Center (previously known as the Amoco Building and The Standard Oil Building before that), there is a Sounding Sculpture by artist Harry Bertoia. These thin brass rods create a musical hum when the wind blows. 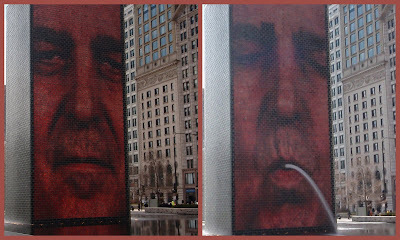 The Crown Fountain in Millennium Park has two large screens that display several different faces in rotation. At regular intervals during the Spring, Summer, and early Fall, the faces spit water into the plaza area. On really hot days, you'll see visitors, mostly children, getting cooled off. The mouths are lined up with the water spout to give the illusion of the faces spraying water. The faces are the artist's (Jaume Plensa) modern take on the gargoyles and mythical creatures that usually spray the water in fountains. This sculpture, created by Milton Horn in 1954, is called Chicago Rising from the Lake. Amazingly, this piece of art sat in a storage facility for over 10 years until someone re-discovered it. The Department of Cultural Affairs brought it back to life and installed it on the Columbus Drive Bridge in the late 1990s. It is a 12 by 14 foot bronze relief that weighs almost three tons. 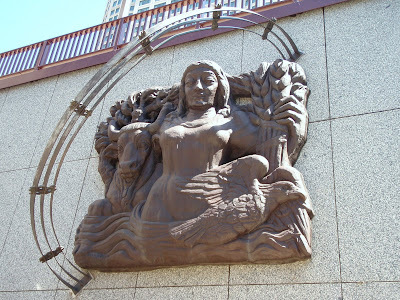 According to various websites, Chicago, shown as a female figure, is rising from Lake Michigan and is surrounded by items that are representative of Chicago's industry: a sheath of wheat, a steer, and an eagle. I'm assuming those are symbols for commodity trading, stockyards and meat processing, and financial institutions. Northerly Island, formerly Miegs Field, is quietly becoming quite the nature and recreation area. Nice bike/running/walking paths exist and it is starting to attract migratory and resident birds. 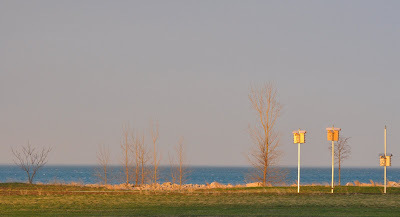 Last Friday, a slightly clouded sunset really brightened up the birdhouses that are along the shore. Fog rolled in again this morning, blanketing parts of the lakefront. 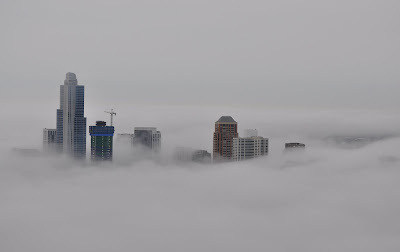 I've always found it an interesting perspective when the fog only covers the bottom half of the skyline - making it look like the buildings rise higher than the clouds (or, that these phantom buildings are floating around). Yes, this is the Chicago Skyline - a segment of it that you don't often see. I guess you can call it the New South Loop skyline. A lot of high rise buildings - offices and residential - have sprung up in the south Loop in the last several years. "A tree could give an insect a lunch, and we need insects." "One tree makes a difference to me because it gives us oxygen and makes our community look a little better." "When a tree grows for years and years, it holds special memories we can all share and it becomes a part of this world." 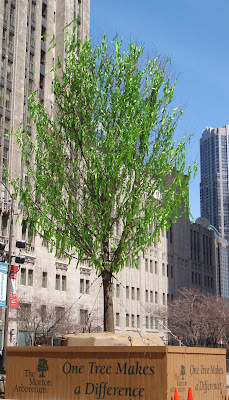 The tree, a Triumph elm, will be permanently planted in Grant Park. school - Sail Columbia - for children and adults. Looks like they were setting up for a class or a practice session. It was certainly a nice day for a sail. 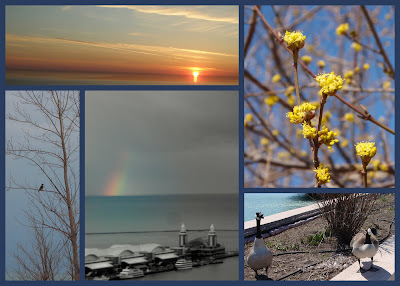 A collage of scenes for Earth Day! Drill, Baby, Drill ... in Millennium Park? No, they aren't trying to fill in the city budget shortfall by looking for oil under Millennium Park. This, like the giant red T-Rex, is part of "The Big World: Recent Art From China" exhibit that is taking place in Millennium Park. This one is called "Kowtow Pump". There are three oil rigs created by artist Shen Shaomin. They're supposed to be caricatures of oil rigs so, instead of moving smoothly when activated, they will twitch erratically. They remind me of giant ants from an old science fiction movie. Since it is still early in the boating season in Chicago, the water fowl still have the run of the harbors. This loon, in Montrose Harbor, is taking advantage of one of the last "boat-free"weekends. 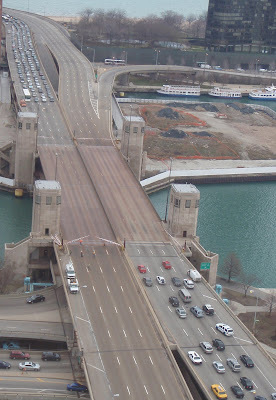 Although I think they tested the Lake Shore Drive bridge, shown here, earlier this month, they must not have been able to test the Michigan Avenue bridge. It was stuck for over an hour on Saturday afternoon. Yesterday started out cold, cloudy and gray. By afternoon, though, the clouds were leaving and it was warming up. By evening, we were treated to clears skies and a sunset that gilded the skyline. It's been quite a while since I've been to the Thompson Center (aka the State of Illinois Building). I'd forgotten that it has a rather interesting atrium. I like the design that was created by the lighting fixtures and the reflections on the glass on the side of the aisles. Early Spring means Ramp Season in the midwest. Ramps (Allium Tricoccum), a cross between onions and garlic, have a very short season - a few weeks - so you have to enjoy them while you can. They are the first green edible item to emerge after winter -- kicking off the new growing season. For seasonal eaters that means the days of root vegetables, root vegetables, and more root vegetables are over. There is a great local organization called The Land Connection, and its big fundraiser, recently held, is called RampFest. Local chefs cook up dishes highlighting ramps. These are ramps and they make a great pasta sauce (more a ramp pesto). They are also great in omelettes. OK. So what do ramps have to do with Chicago? Well, according to a few sources, they are probably the reason for the city's name. The Potawatami word for wild onions (also skunk but we'll ignore that variation) is Checagou. Apparently there were a lot of ramps growing here in the "old days" and the area had a distinct aroma. One of the Riverwalk Murals memorializes the impact ramps had on Chicago (the ramps are at the top of the mural, above the boat). 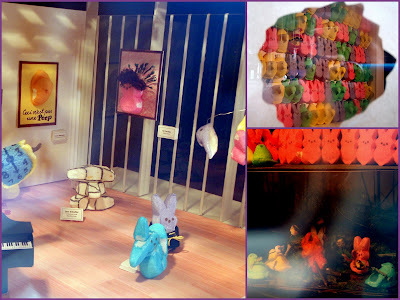 I had a feeling I knew what kind of "Peep Show" this would be. 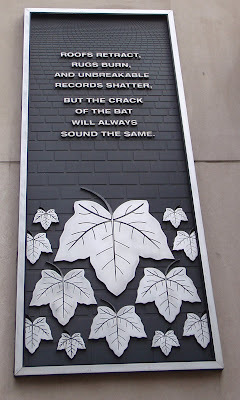 It was, after all, a window in the Tribune Building on Michigan Avenue, not a "book store" on Wells Street. But I had to look to make sure. April is Child Abuse Prevention Month. Every year, the Fourth Presbyterian Church brings this issue to everyone's attention by tying blue ribbons to the trees in front of the church. According to the sign in front of these trees, there were 29,940 confirmed cases of child abuse in Illinois in 2008. That's too many blue ribbons. There's always one. The last one to leave. This pile of snow in Federal Plaza is hanging on way past its welcome. It should be gone by the weekend, though. I didn't expect to see a large metal Tyrannosaurus Rex statue in Millennium Park. I guess I should have paid closer attention to the news. There's a new outdoor art exhibit in Millennium Park. It features art from four sculptors from China. Until it opens officially on April 9, the T-Rex is the only one of the four I can get close enough to for a photo. 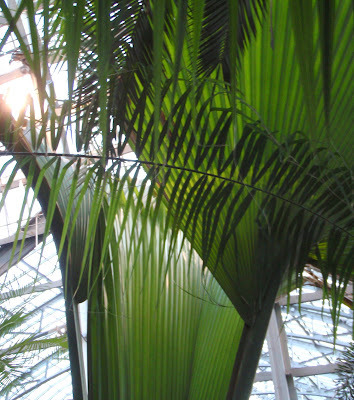 The Garfield Park Conservatory has what they think is the world's largest Double Coconut Palm growing under glass. They grew it from seed, which weighs 50 pounds, in 1959 -- making this plant 50 years old this year. 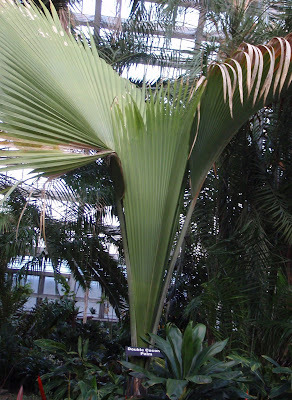 The Double Coconut Palm is only found in nature in the Seychelle Islands, off the coast of southern Africa. Technically, yesterday was Opening Day for the 2009 Baseball season. Today is opening day for the Chicago teams. Well, one of the Chicago teams. The Chicago White Sox were supposed to play their home opener today. The weather forecast (snow and 30s) resulted in the game being postponed. (I didn't understand that at first - postponing the game because of a forecast. It may not actually snow. The early decision was made to get the make-up game quickly rescheduled for Tuesday April 7). ... some pillow gets its stuffing poked out! Today was International Pillow Fight Day. Apparently the second one. It's a type of flash mob. I had heard about it through an e-mail I get on things to do in Chicago. It sounded like a fun thing to see. It was held by The Art Institute on Michigan Avenue. Security guards made sure that no pillow fighting took place on the stairs of the Art Institute. (Another watcher explained that the sidewalk is public property but the stairs are Art Institute property so if someone gets hurt on the stairs, then the Art Institute would be liable.) Everything seemed to go peacefully. Only a few pillows were harmed. I'm not 100% sure, but I think the Chicago Transportation guys were testing the gates in preparation for the upcoming sailboat "bridge runs". 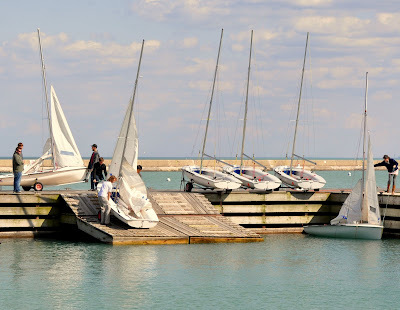 In the Spring, there are scheduled "bridge lifts" on Saturdays and Wednesdays so the sailboats can get to their summer homes (Chicago Harbors) from their winter homes (various boatyards). The first one is Saturday April 18. Yes, I know --it ties up traffic. But it is really beautiful to watch the sailboats come through. 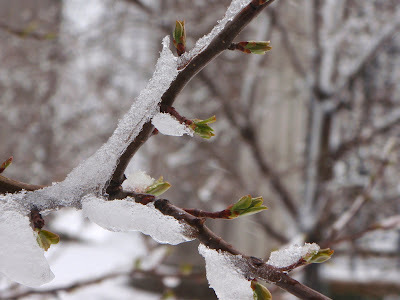 One last picture from last weekend's Spring snow. It was a heavy, wet snow so it clung to the branches. you knew the snow wouldn't be sticking around very long. Today is Theme Day on City Daily Photo. April's theme, voted on by the members, is Yellow. This collage of yellow vehicles just kind of happened. 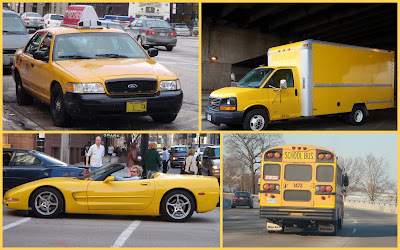 It started with the yellow school bus on Lake Shore Drive. I took that picture "just in case" I couldn't find anything else yellow for the Theme Day. Then I saw the yellow moving truck. A theme was developing. The last one is a 'blond' in a yellow convertible, taken on one of the Spring Teaser days we had in early March.